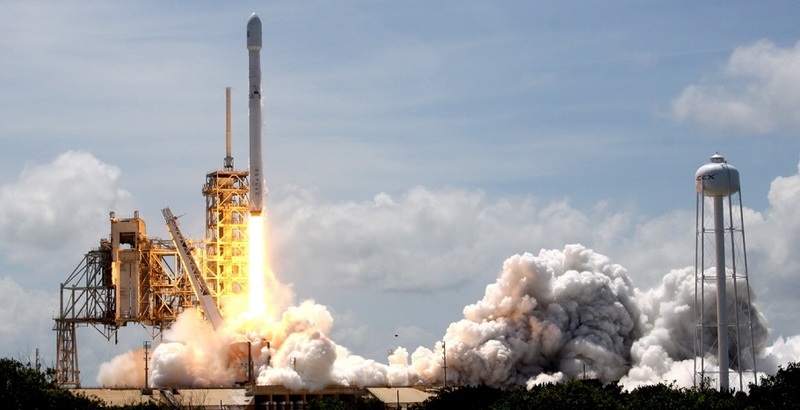 Perhaps the best word to use to describe the launch tempo for Hawthorne, California-based Space Exploration Technologies (SpaceX) would be: relentless. With a mission launching about every two or three weeks from Kennedy Space Center’s Launch Complex 39A, the flight of the Bulgariasat-1 mission on Friday, June 23, only served to underscore that theme. Friday’s flight had been slated to take place an hour earlier, but with two hours in the launch window, SpaceX mission planners opted to push the launch back one hour. Prior to Friday’s flight, SpaceX’s CEO and Founder, Elon Musk, stated that the chances of a recovery of the first stage were slim: “Falcon 9 will experience its highest ever re-entry force and heat in today’s launch. Good chance rocket booster doesn’t make it back.” However, battered and blackened, the stage successfully landed about eight-and-a-half minutes after liftoff. The first stage of the rocket on this mission was also the core that carried out the sole successful landing out in the Pacific after the launch of the January 2017 Iridium-1 mission from California. The booster was refurbished and retested (via a static test fire on June 15) preparing it for Friday’s flight. At approximately 34 minutes and 55 seconds after it had left the pad that sent Neil Armstrong, Buzz Aldrin, and Michael Collins on their historic voyage to the Moon – Bulgariasat-1 was deployed. As if to reinforce the frenetic launch tempo that SpaceX is operating under, the company has another flight, that of the Iridium NEXT 2 mission, currently set to take place from Vandenberg Air Force Base’s Space Launch Complex 4E (East) on Sunday, June 25, at 1:24 p.m. PDT.